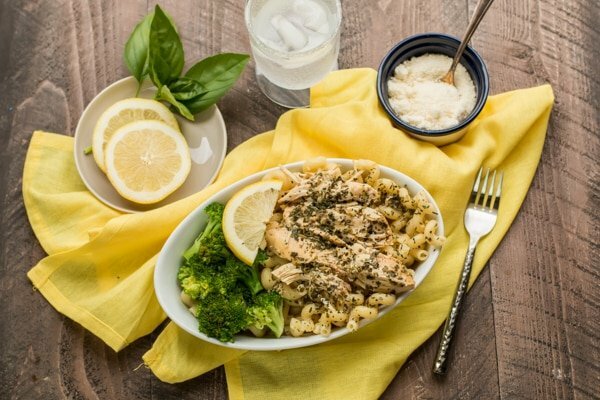 Slow Cooker Lemon Pesto Chicken. This tangy chicken and sauce go great over pasta or rice, and this meal is freezer meal friendly! 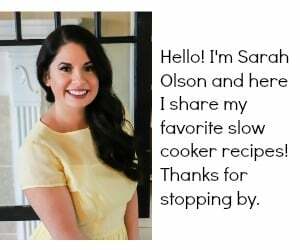 Here is another edition of Freezer Slow Cooker Recipe of the Month! 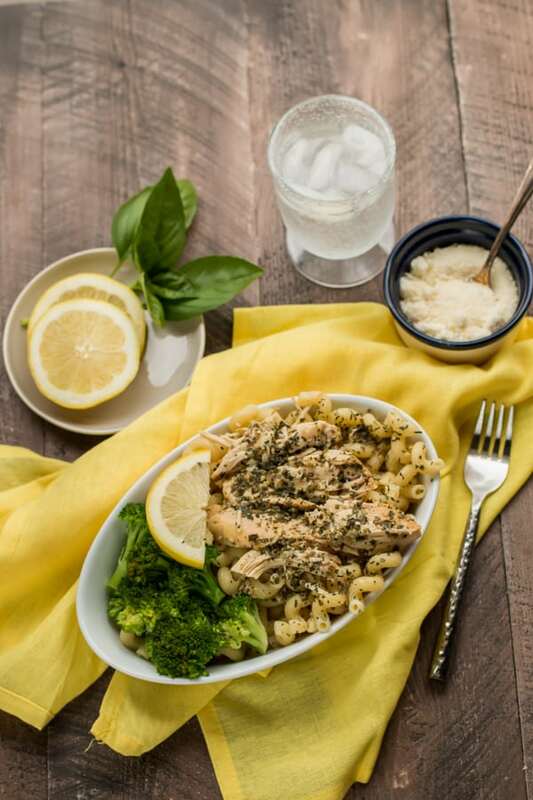 This month’s recipe is Slow Cooker Lemon Pesto Chicken. This meal freezes very well, no funny taste or mushiness after being thawed and cooked. I serve this chicken and sauce over pasta, and top with parmesan cheese. Putting this meal into freezer bags is easy peasy. No chopping! Just cut some lemons in half, squeeze the juices, then load up the bags. 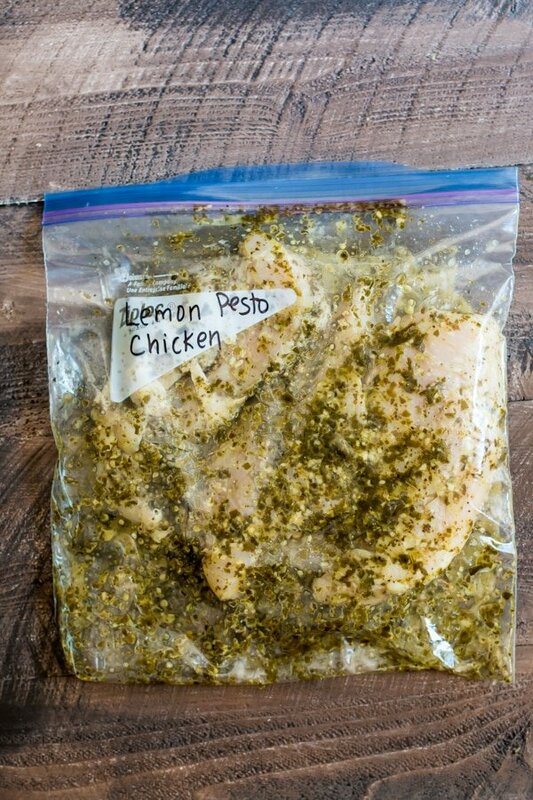 I make 2 freezer meals at a time since the jar of pesto is just enough for 2 recipes. This meal does not need to be made into a freezer meal if you aren’t into doing that. 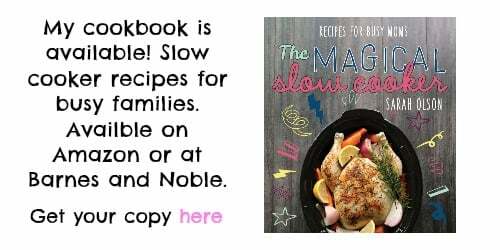 You can add the ingredients directly to the slow cooker. I was so happy that my daughter loved this meal. Usually she won’t eat anything with green seasonings on it, that’s pretty much every recipe I make! 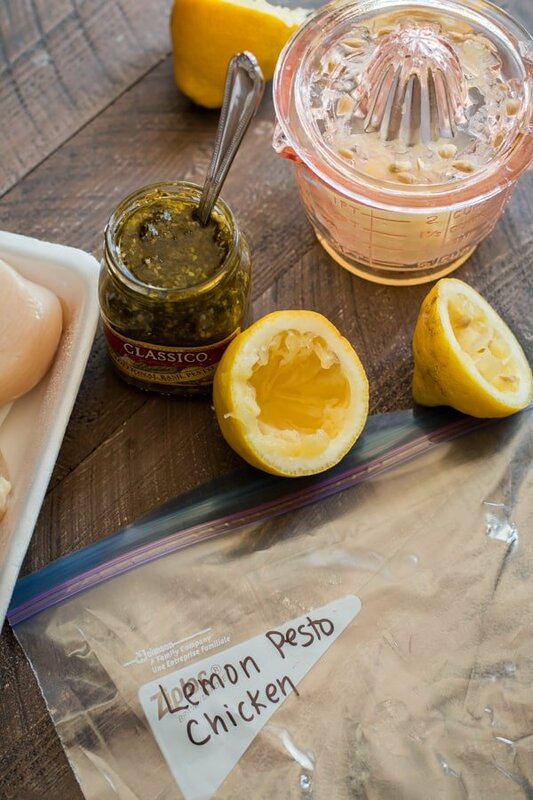 I hope you enjoy this Slow Cooker Lemon Pesto Chicken! Have a great weekend. I’ll be back early next week with a new recipe. Add everything to the slow cooker. Cover and cook on LOW for 6-8 hours. Serve over pasta or rice, topped with parmesan cheese. Add everything to a gallon Ziplock bag. Squeeze out excess air and seal. 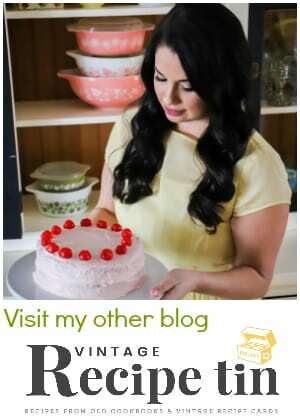 Place in freezer for up to a month. When ready to make, thaw for 24 hours in the fridge. Follow cooking instructions above. I used Classico basil pesto for this recipe, it’s next to the jarred pasta sauces in the grocery store. This was great, but 8 hours (even on low) was waaaayyyyy too long. The chicken was pretty dry. Next time, I think I’ll try 6 hours and see how that goes. Thanks for your input! I added to the recipe 6 hours cooking time too. If I wanted to cook this on high (want to slow cook it but too limited on them for 6-8 hours), how long should it cook for? I would do 4 hours on high. Can fresh pesto be used? I think that would be wonderful in this! I just never have time! Can you use frozen chicken breast and regular fresh ingredients? I’ve only tried with thawed. 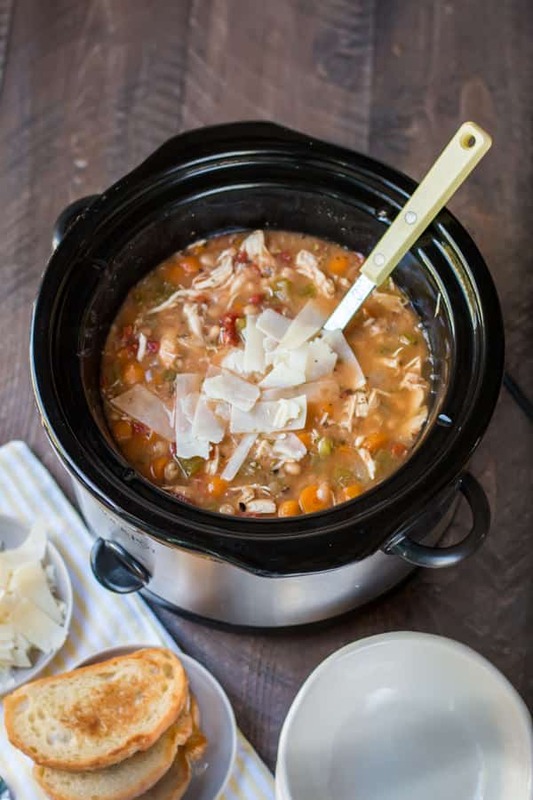 I made the Lemon Pesto Chicken & Tuscan Chicken Soup this week and 8 hours in my slow cooker was just right. Don’t know why everyone was up in arms about wanting to cook it shorter. The chicken was perfect for both. Loved them both, and my wife loved them both…along with me!! 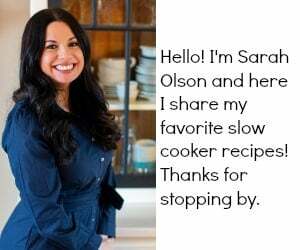 I Love your recipes Sarah! Really happy to hear that Todd, glad your wife loved it too! Are there any veggies that I could add to cook with the chicken? Like roasted red peppers etc? Thanks! Yes. Think that would work just fine and such a great idea.